The link below is to an article that looks at an emerging trend in book cover design – yellow. I bought the box set immediately. Almost a decade later I’m still reading my way through them all, but I bought them to have and to hold as much as to read. Created by British designer David Pearson, each book is a handsome object; embossed typography and graphic elements on white uncoated stock, printed only using red and black ink. The typographic treatment of each cover reveals something about the content of the book. It is a deceptively simple looking series design that, on thoughtful reflection, is a work of genius. I show Great Ideas, as well as Pearson’s design for Penguin’s Great Journeys, pictured below, as a way to explain series design to my students. Each cover must work aesthetically on its own, but also as part of a collection. To make each book unique but still comfortably part of a series is a difficult design challenge and as with all excellent design, when it works perfectly we can’t imagine it being done any other way. The Australia Book Designers Association (ABDA) invited Pearson to be the international judge for this year’s Book Design Awards held in May alongside the Sydney Writers’ Festival. Pearson joined local designers Kirby Armstrong, Allison Colpoys, Vince Frost and Fabio Ongarato, along with book buyer Meredith Drake, literary writer Stephen Romei and publisher Lou Johnson, to award excellent Australian book design across 15 categories. ABDA was formed in 2014 by a group of 8 book designers and a business person, to take over running the Book Design Awards after the Australian Publishers Association announced it would no longer run the annual awards. In March 2014 the non-profit organisation was officially incorporated as the Australian Book Designers Association. Beyond running the awards, the Association’s mission is to promote Australian book design and foster a design community through public events and educational programs. Inviting international judges is the first step in achieving this goal, with legendary UK book designer Jon Gray (better known as Gray318) joining the local judges in 2014, and Pearson this year. 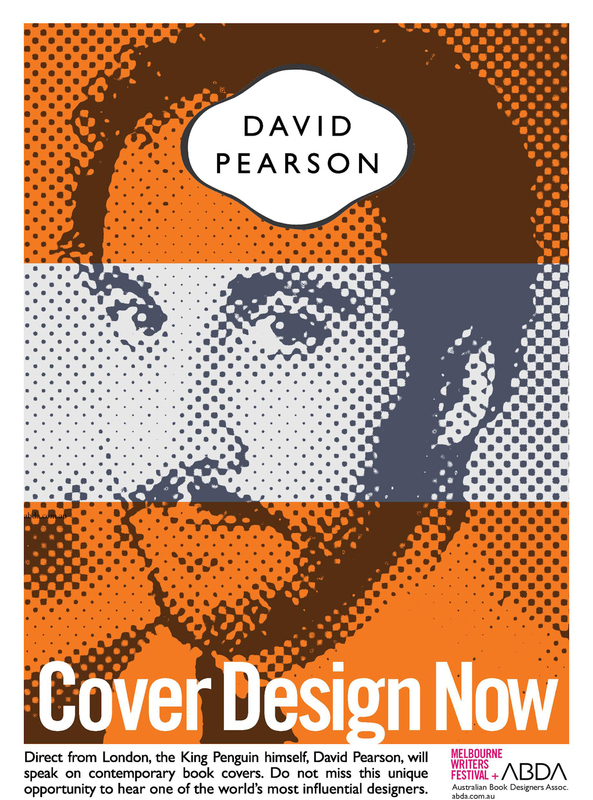 In addition, ABDA has collaborated with the Australian Graphic Design Association and the Melbourne Writers’ Festival to bring David Pearson to Australia for a tour of Sydney and Melbourne next week. Pearson will deliver three public lectures in Australia. The first titled ‘We Are What You Read’ will be in Sydney at 6.30pm on Tuesday 25 August, at the Powerhouse Museum in Ultimo, co-presented by ABDA and AGDA. The second titled ‘The Book Look: Contemporary Cover Design’ will be held at Deakin Edge as part of the Melbourne Writers Festival, 7pm on Saturday 29 August. Pearson will be in conversation with WH Chong discussing the role design plays in current and future publishing. Chong’s exclusive interview with Pearson on his Culture Mulcher column on Crikey.com earlier this week is a fantastic appetiser for the upcoming event, including philosophical design quandries such as ‘Are you symmetric, or asymmetric? Centred or ranged?’. In a second MWF event, Pearson will hold a workshop at The Wheeler Center at 2pm on Sunday 30 August. Participants will be given an insight into his working process and be able to ask questions. Check the links embedded above for tickets to these events. The link below is to an article that looks at book cover design. Beginner’s Guide To Book Cover Design – Tips, Tutorials & Ideas. The link below is to an article that lists 11 things that should be part of an author’s website. The link below is to an article that looks at PapyrusEditor, an online web application that allows you to create, design, publish and sell your ebook. The link below is to an article that looks at bad book cover design. The link below is to an article reporting on book designs – the weird and the wonderful. The link below is to an article on yet another bookshelf idea. It’s not for me, but perhaps for you? Any inspiration here for your library?